I'm dreading today because like yesterday, I have go to MAAD. MAAD stands for the Market for Artists And Designers, a monthly bazaar held at the Red Dot Design Museum, better known as the old Traffic Police Station on Maxwell Road. That's where my wife has set up a stall selling her handmade bags and I have to be there to buy kuek kueh for her and Milo when she gets hungry. You know how a husband has to hold his wife's handbag when she goes to the loo? Well, I have to look after about two dozen bags. As emasculating as that is, that's not why I'm dreading today. It started when my wife first joined MAAD in April. In between my kueh-kueh-and-Milo runs, I was exploring the museum when I made eye contact with a skinny, bald-headed guy who looked familiar. But I couldn't place him and he didn't seem to recognise me, so I ignored him. Seconds after walking away, I realised - hey, that was Edwin Yeo! As long-time New Paper readers may remember, Edwin used to write for the paper for years before I came along. I met him once a few years ago after he joined a public relation company that represented Crazy Horse. 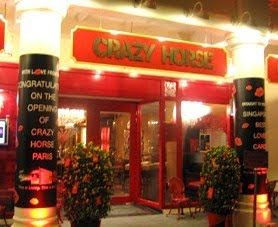 Yes, that Crazy Horse, the one at Clarke Quay with the legally naked busts that went bust in 2007 and is now home to The Bellini Grande. Now years later, in the Red Dot Museum, I was wondering whether I should say hi to him, but the moment had passed. He probably didn't even remember me. Anyway, it didn't matter because I figured I wouldn't see him again. 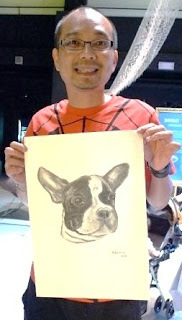 As it turned out, Edwin has a regular stall at MAAD where he offers to draw a portrait of your dog. Not you, the human being, but only your dog. 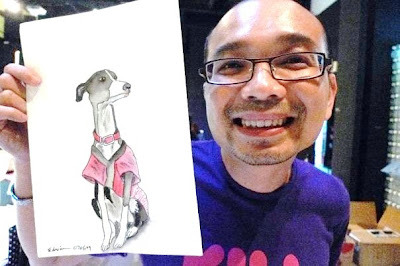 So every month when my wife took part in MAAD, I would see Edwin there with his pooch portraits, but I couldn't bring myself to say hi to him because I had failed to do so the first, second, third, fourth and subsequent times. It just became way too awkward for me. But eventually, Edwin and I settled into this unspoken relationship where we would ignore each other every month at MAAD, which was fine - until three Saturdays ago. That was when Edwin started writing a weekly sports column in The New Paper - where I'm also writing a weekly column! How do I pretend not to know him now? Talk about awkward. This weekend's MAAD is the first one since his return to these pages. You know, I've fantasised about how I'd say hi to Edwin, shake his hand and joke about how I couldn't say hi to him before. Then we'd reminisce about Crazy Horse, trade gossip about The New Paper newsroom and giggle like little schoolgirls. There's no way the actual event could live up to the hype I've built up in my head.